The new ReplyButler 4.00 is available and brings great news. The biggest one is the support for the plentyMarkets shop system. If you’re running such a shop, you’ll see immediately the key data for each e-mail: customer number, address, order number, status and package number. The text modules can also use the shop system’s data. 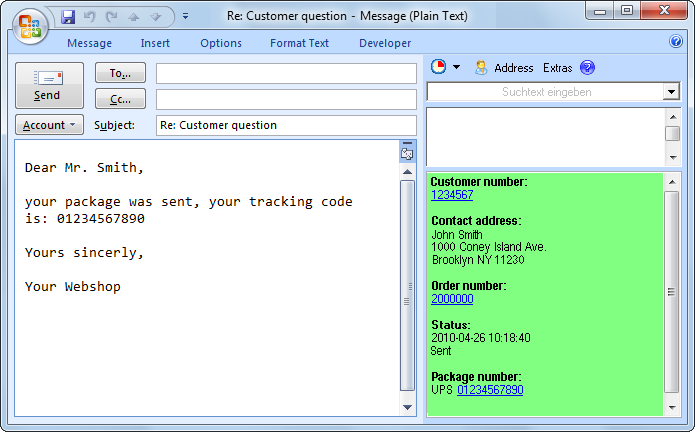 Such a text module might for example automatically include the package number of the customer’s most recent order. If that’s not enough there’s a hotkey to bring you from the e-mail or e-mail list to the customer page in your shop administration. Furthermore the text modules can now include images and add new recipients to the e-mail. And if you’re using a different CRM / shop system, you can configure the mentioned features yourself manually. More information about ReplyButler for Outlook and text modules can be found on the homepage, and there’s a new sub-page just for plentyMarkets. The new version 4.0 of Easy2Sync for Outlook is available. While the previous version only had a “half” support for Outlook 2010, this release completely supports the new Microsoft Outlook version. Including the 64 bit mode. This works completely automatically, the user doesn’t have to do anything special. Even the combination of the 64 bit mode with other / older 32 bit Outlook versions is supported. We have just published version 3.04 of our Outlook duplicate recognition software 1-Click duplicate delete for Outlook. It’s easy to summarize the changes: We have improved the duplicate recognition algorithms to allow more types of duplicates (especially duplicate e-mails in Outlook) to be automatically recognized. More info about the program can be found on at Outlook duplicate removal product page.